On the second day of the 2nd Hellenic Innovation Forum, Executives representing companies involved in the innovation sector in all areas of the economy will present their products and services to various investors (funds, angel investors, investors from the public sector etc.). The showcasing of Greek innovation and those businesses which can really give a different impetus to the Greek economy is the objective of the 2nd Hellenic Innovation Forum, which this year is honouring Holland. Under the auspices of the National Documentation Centre (EKT), the Forum will take place in Athens ( Divani Caravel Hotel) on 19th and 20th June. EKT is organizing a special event for entrepreneurship and networking to be held on the second day! Promoting innovation is the way forward for economic growth and in recent years a great number of companies – both new and old- have used technologies of every kind and created new business models which have resulted in them operating successfully in Greece and abroad. Greece has always been a country where entrepreneurship has flourished and innovative ideas have found space for development. Even during the economic crisis, there were a number of projects which show the significant potential of Greek manpower, as well as the opportunities that exist for investment in efforts with many developmental opportunities and international perspectives. These efforts –highlighting and enhancing them- will be the focus of the 2nd Hellenic Innovation Forum to be held on 19th and 20th June at the Divani Caravel Hotel. 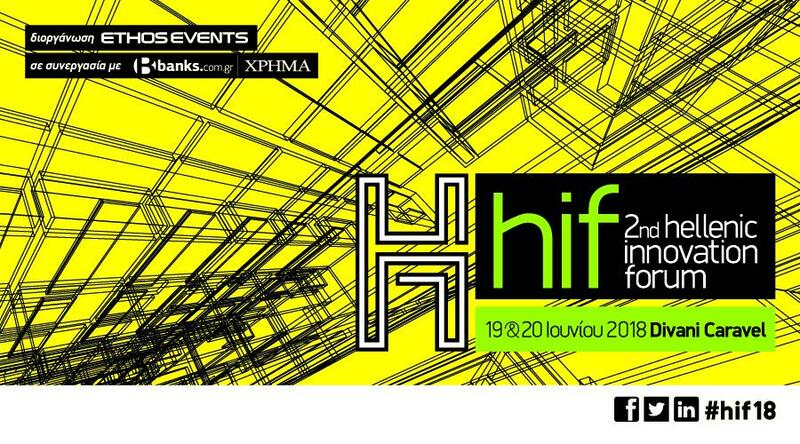 The event is being held for the second successive year by Ethos Events, in co-operation with the financial and business portal banks.com.gr and the HRIMA magazine. Over the two days of the 2nd Hellenic Innovation Forum, there will be talks and presentations, while innovative businesses will be allocated their own space to demonstrate the potential of their products. The Forum is not only for startups but also businesses of all sizes involved in the innovation sector in Greece. During the first day, presentations will focus on the problems that innovative and outward-looking businesses face in various stages of their growth. Issues to be covered include: Idea, Start-up, Growing Business, Grown Business and International. On the second day of the 2nd Hellenic Innovation Forum, business plans for some of the best projects in Greece seeking funding and partners will be presented to investors at a special session. After the presentations, there will be an opportunity to arrange B2B meetings between the prospective entrepreneurs and the funders. Representatives of the National Documentation Centre will be at its stand to present its actions to promote research and innovation, as well as its publications with indicators and statistics for Greek research and innovation activities. EKT is also organising an event featuring dynamic innovative businesses on the second day. (Wednesday 20th June, 12:00-14:00). For further details visit the official forum site, Ethos Events’ social media Facebook, LinkedIn, twitter .